The larynx is located within the anterior aspect of the neck, anterior to the inferior portion of the pharynx and superior to the trachea. Its primary function is to protect the lower airway by closing abruptly upon mechanical stimulation, thereby halting respiration and preventing the entry of foreign matter into the airway. 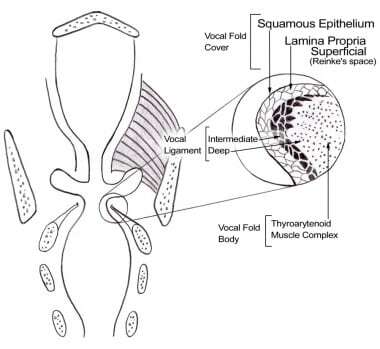 Other functions of the larynx include the production of sound (phonation), coughing, the Valsalva maneuver, and control of ventilation, and acting as a sensory organ. This video is of an esophagoscopy on a 3 year old child. The esophagoscope is introduced through the mouth. As the scope enters the esophageal inlet, you can see the larynx with an endotracheal tube passing through the vocal folds. Video courtesy of Ravindhra G Elluru, MD, PhD. The cricoid cartilage is a ring of hyaline cartilage located at the inferior aspect of the larynx and is the only complete ring of cartilage around the trachea. It has the shape of a "signet ring," with a broad portion posterior to the airway (lamina of cricoid cartilage) and a narrower portion circling anteriorly (arch of cricoid cartilage). The posterior surface of the lamina contains 2 oval depressions, which serve as attachment sites for the posterior cricoarytenoid muscles, separated by a vertical midline ridge that serves as an attachment to the esophagus. At the junction of the lamina with the arch, small, round articular facets exist on the outer posterolateral surface of each side of the ring that articulate with the inferior horn of the thyroid cartilage. The lower border of the cricoid cartilage is connected to the first tracheal ring by the cricotracheal ligament. The upper border of the cricoid cartilage gives attachment to the cricothyroid ligament on the anterior midline, the cricothyroid muscles on the lateral aspects, and the bases of a pair of arytenoid cartilages on both sides of the posterior aspect. The thyroid cartilage is the largest of the laryngeal cartilages. It is formed by a right and a left lamina that are separated posteriorly and joined together at an acute angle in the anterior midline, forming the laryngeal prominence, commonly known as the Adam’s apple. The laryngeal prominence is more apparent in men, because the angle between the 2 laminae is more acute in men (90°) than in women (120°). 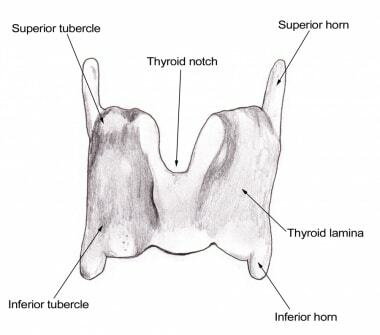 The superior thyroid notch is a V-shaped notch immediately above the laryngeal prominence, while the inferior thyroid notch is less distinct and located in the midline along the base of the cartilage (see the image below). The 2 laminae are quadrilateral in shape and form the lateral surfaces of the thyroid cartilage that extend obliquely to cover each side of the trachea. The posterior aspect of each lamina is elongated to form a superior horn and inferior horn. The medial surfaces of the inferior horns articulate with the outer posterolateral surface of the cricoid cartilage. The inferior border of the thyroid cartilage is attached to the cricoid cartilage by the cricothyroid membrane in the midline and the cricothyroid muscles on either side. The superior horn along with the entire superior edge of the thyroid cartilage is attached to the hyoid bone by the thyrohyoid membrane. The epiglottis is a leaf-shaped cartilage that moves down to form a lid over the glottis and protect the larynx from aspiration of foods or liquids being swallowed. It is attached by its stem to the midline of the inner aspect of the thyroid cartilage, about halfway between the angle of the laryngeal prominence and the inferior notch. It is attached via the thyroepiglottic ligament and projects posterosuperiorly to cover the superior opening of the larynx. The midline of the superior surface of the epiglottis is also attached to the body of the hyoid bone via the hyoepiglottic ligament. The mucous membrane covering the upper anterior part of the epiglottis reflects off the sides of the epiglottis, giving rise to the glossoepiglottic folds. The aryepiglottic folds are mucosal folds on the posterior surface of the epiglottis. The depressions on either side of the median fold, between the root of the tongue and the epiglottis, are called the valleculae epiglottica. 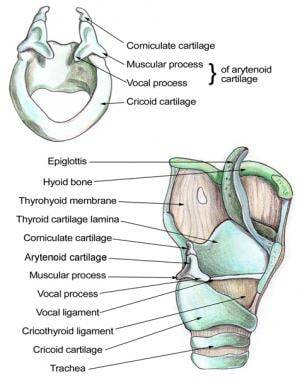 The arytenoid cartilages form the part of the larynx to which the vocal ligaments and vocal folds attach. They are pyramidal in shape and have 3 surfaces, a base, and an apex. They are located superior to the cricoid cartilage in the posterior part of the larynx, with the base of the arytenoid cartilages articulating on either side with the posterior aspect of the upper border of the cricoid lamina. The anterior angle of the base of the arytenoid cartilage is elongated to form a vocal process for attachment of the vocal ligament, while the lateral angle is elongated to form a muscular process for attachment of the posterior and lateral cricoarytenoid muscles. The posterior surface of the arytenoid cartilage gives attachment to the arytenoid muscle. The anterolateral surface has 2 depressions for attachment to the false vocal cord (vestibular ligament) and the vocalis muscle. The medial surface has a mucosal lining that forms the lateral aspect of the respiratory part of the glottis. The apex of the arytenoid cartilage is pointed and articulates with the corniculate cartilage. The corniculate cartilages are 2 small, conical cartilages that articulate with the apices of the arytenoid cartilages, serving to extend them posteriorly and medially. They are located in the posterior parts of the aryepiglottic folds of mucous membrane. The cuneiform cartilages are 2 small, club-shaped cartilages that lie anterior to the corniculate cartilages in the aryepiglottic folds. They form small, whitish elevations on the surface of the mucous membrane just anterior of the arytenoid cartilages. The thyrohyoid membrane is a broad fibroelastic ligament that spans between the superior border of the thyroid cartilage and the hyoid bone above. It contains an aperture on the lateral surfaces of each side for the superior laryngeal arteries, nerves, and lymphatics. The hyoepiglottic ligament extends from the midline of the superior surface of the epiglottis to the body of the hyoid bone, located anterosuperiorly. The cricotracheal ligament connects the lower border of the cricoid cartilage to the upper border of the first tracheal cartilage ring. The conus elasticus, a submucosal membrane, extends superiorly from the anterior arch of the cricoid cartilage and attaches to the thyroid cartilage anteriorly and the vocal processes of the arytenoid cartilages posteriorly. The free superior margin of the conus elasticus is thickened to form the vocal ligament, which forms the vocal folds (true vocal cords) once covered by mucosa. The quadrangular membrane, another submucosal sheet, extends between the lateral aspects of the epiglottis and the anterolateral surface of the arytenoid cartilages on each side. The free lower inferior margin of this membrane is thickened to form the vestibular ligament, which forms the vestibular folds (false vocal cords) once covered by mucosa. The laryngeal central cavity is tubular in shape and lined with mucosa. The superior aspect of the cavity (laryngeal inlet) opens into the pharynx, inferior and posterior to the tongue. The inferior aspect of the cavity is continuous with the lumen of the trachea. The laryngeal cavity may be divided into 3 major regions: the vestibule, the middle, and the infraglottic space. The vestibule is the upper portion of the cavity, in between the laryngeal inlet and the vestibular folds. The middle portion of the cavity, or the voice box, is formed by the vestibular folds above and the vocal folds below. The infraglottic space is the lower portion of the cavity, in between the vocal folds and inferior opening of the larynx into the trachea. On either side of the middle laryngeal cavity, between the vestibular and vocal folds, the mucosa bulges laterally to form troughs known as the laryngeal ventricles. The laryngeal saccules are tubular extensions of each ventricle anterosuperiorly between the vestibular fold and the thyroid cartilage. It is thought that the walls of these saccules contain many mucous glands that lubricate the vocal folds. The rima vestibuli is the triangular-shaped opening between the 2 adjacent vestibular folds. The apex lies anterior and the base is formed by the posterior wall of the laryngeal cavity. The rima glottidis is a narrower, triangular-shaped opening that lies beneath the rima vestibuli, formed by the 2 adjacent vocal folds. The piriform recesses (piriform sinuses) are present on either side of the anterolateral wall of the laryngopharynx. They are bounded medially by the aryepiglottic folds and laterally by the thyroid cartilage and thyrohyoid membrane. They are a common place for food to become trapped. The cricothyroid muscles are attached to the anterolateral surfaces of the arch of the cricoid cartilage and expand superiorly and posteriorly to attach to the inferior border of the thyroid cartilage. They are the only laryngeal muscles supplied by the external branch of the superior laryngeal nerve, a branch of vagus nerve (cranial nerve [CN] X) below the base of the skull. These muscles function to elevate the anterior arch of the cricoid cartilage and depress the posterior portion of the thyroid cartilage lamina. This produces tension and elongation of the vocal cords, resulting in higher-pitch phonation. The posterior cricoarytenoid muscles extend from the oval depressions on the posterior surface of the cricoid lamina on each side and extend upward to the muscular process of the arytenoid cartilage on the same side. These muscles function to rotate the arytenoid cartilages laterally, thereby abducting the vocal cords. Their action opposes that of the lateral cricoarytenoid muscles. The posterior cricoarytenoid muscles receive innervation from the recurrent laryngeal branch of the vagus nerve (CN X). The lateral cricoarytenoid muscle on each side extends from the upper border of the arch of the cricoid cartilage to the muscular process of the arytenoid cartilage on the same side. These muscles function to rotate the arytenoid cartilages medially, thereby adducting the vocal cords. The lateral cricoarytenoid muscles receive innervation from the recurrent laryngeal branch of the vagus nerve (CN X). The transverse arytenoid muscle is a single muscle that extends between the posterior surfaces of each arytenoid cartilage. Its main function is adduction of the vocal cords, and it is innervated by both recurrent laryngeal branches of the vagus nerves (CN X). The thyroarytenoid muscles run from a vertical line on the interior surface of the thyroid cartilage angle and adjacent to the external surface of the cricothyroid ligament to the anterolateral surface of the arytenoid cartilage. Each muscle consists of 2 parts: the vocalis and thyroepiglottic part. The vocalis part lies deep and inferior, parallel with the vocal ligament to which it is attached at the posterior end. The thyroepiglottic part is occasionally described as a separate muscle; it lies superior and continues into the aryepiglottic fold, where some fibers extend to the margin of the epiglottis. These muscles function to draw the arytenoid cartilages forward, thereby relaxing and shortening the vocal cords, while also rotating the arytenoid cartilages inward, thus adducting the vocal folds and narrowing the rima glottis. The thyroarytenoid muscles receive innervation from the recurrent laryngeal branch of the vagus nerve (CN X). The superior laryngeal nerves arise from the inferior ganglia of the vagus nerve and receive a branch from the superior cervical sympathetic ganglion on each side in the upper neck. They descend adjacent to the pharynx on either side, behind the internal carotid artery, and divide into internal and external branches. The external branch (external laryngeal nerve) descends beneath the sternothyroid muscle and supplies the cricothyroid muscle. Injury to this nerve during thyroidectomy or cricothyrotomy causes hoarseness of the voice and an inability to produce high-pitched sounds. The internal branch (internal laryngeal nerve) pierces the thyrohyoid membrane and supplies sensory innervation to the laryngeal cavity down to the level of the vocal folds. It is responsible for the cough reflex. The recurrent laryngeal branches of the vagus nerves ascend into the larynx within the groove between the esophagus and the trachea. The left recurrent laryngeal nerve originates in the thorax, looping under the aortic arch before ascending, while the right recurrent laryngeal nerve originates in the neck. These nerves are responsible for supplying sensory innervation to the laryngeal cavity below the level of the vocal folds, as well as motor innervation to all laryngeal muscles except the cricothyroid. Since the nerves run immediately posterior to the thyroid gland, they are at risk of injury during thyroidectomies. Unilateral nerve damage presents with voice changes, including hoarseness. Bilateral nerve damage may result in aphonia (inability to speak) and breathing difficulties. The superior and inferior laryngeal arteries supply the majority of blood to the larynx. The superior laryngeal artery originates from the superior thyroid branch of the external carotid artery and enters the larynx with the internal branch of the superior laryngeal nerve through the lateral aperture of the thyrohyoid membrane. The inferior laryngeal artery originates from the inferior thyroid branch of the thyrocervical trunk, which is a branch of the subclavian artery. It ascends into the larynx within the groove between the esophagus and the trachea, along with the recurrent laryngeal branch of the vagus nerve (CN X). The superior and inferior laryngeal veins drain the larynx and share the same course as the arteries. The superior laryngeal veins drain into the superior thyroid veins, which empty into the internal jugular veins. The inferior laryngeal veins drain into the inferior thyroid veins, which both empty into the left brachiocephalic vein. The lymphatic vessels that drain above the vocal folds travel along the superior laryngeal artery and drain to the deep cervical lymph nodes at the bifurcation of the common carotid artery. The lymphatic vessels that drain below the vocal folds travel along the inferior thyroid artery and drain to the upper tracheal lymph nodes. During swallowing, the rima glottidis, rima vestibuli, and vestibule are closed. The backward motion of the tongue forces the epiglottis over the opening of the glottis to cover the laryngeal inlet and prevent aspiration of swallowed material into the lungs. The larynx also moves upward and forward, which helps to open the esophagus for the passage of the swallowed material. During respiration, the rima glottidis, rima vestibuli, and vestibule are open. The vocal folds may be further abducted during forced inspiration, by the action of the posterior cricoarytenoid muscles, thus widening the rima glottidis and increasing the diameter of the laryngeal airway. During phonation, the vocal cords and arytenoid cartilages are adducted. When air is forced through the closed rima glottidis, the vocal cords vibrate against one another to produce sounds. Laryngomalacia is a common condition seen in children and is the most common congenital lesion of the larynx. The immature laryngeal cartilage of the upper larynx collapses inward during inhalation, resulting in partial airway obstruction and inspiratory stridor. The supraglottic larynx is tightly curled, with shortened aryepiglottic folds causing the epiglottis to curl on itself; this results in an “omega-shaped” epiglottis in visual examination. Presbylarynx is a condition in which age-related atrophy of the laryngeal soft tissues results in loss of vocal fold tone and changes in phonation. Vocal fold bowing is often observed on visual examination. Laryngitis is the inflammation and swelling of the larynx. It may occur secondary to allergic, viral, chemical, or bacterial insult. However, the most common causes of laryngitis are a generalized upper respiratory tract infection and exposure to environmental toxins, such as cigarette smoke. Although the infection is usually self-limited, the disorder may cause airway obstruction in infants and children. Visual examination of the airway may reveal erythema and edema of the vocal folds, secretions, and irregularities on the surfaces of the vocal folds. Vocal cord reactive nodules, also called polyps, are masses of tissue that grow on the vocal cords, typically on the anterior and middle two thirds of the vocal fold. The nodules usually appear as symmetrical swellings on both sides of the vocal cords and develop most commonly in heavy smokers or individuals who use strenuous or abusive voice practices. Laryngeal squamous papillomatosis is a rare condition caused by a human papillomavirus (HPV) infection of the throat, in particular HPV types 6 and 11. This causes an assortment of papillomas, usually located on the true vocal cords, to develop over a period of time. Although these tumors are benign and do not become malignant, they frequently recur and increase the risk of airway obstruction. Laryngeal carcinoma encompasses a spectrum of epithelial changes seen in the larynx, including hyperplasia, atypical hyperplasia, dysplasia, carcinoma in situ, and invasive carcinoma. On visual examination, these changes may vary from smooth focal thickenings with mild discoloration and occasional keratosis to irregular verrucous and ulcerated lesions. Standring S. The Anatomical Basis of Clinical Practice. Gray’s Anatomy. 40th. Philadelphia: Churchill Livingstone; 2008. Merati AL, Bielamowicz SA. Textbook of Laryngology. San Diego: Plural Publishing Inc; 2006. Ross MH, Pawlina W. Histology: A Text and Atlas with Correlated Cell and Molecular Biology. 6th. Philadelphia: Lippincott Williams & Williams; 2010. Lalwani AK. Current Diagnosis & Treatment Otolaryngology: Head and Neck Surgery. 3rd ed. New York: McGraw-Hill Medical; 2011. Medscape Reference thanks Ravindhra G Elluru, MD, PhD, Associate Professor, Department of Otolaryngology Head and Neck Surgery, University of Cincinnati College of Medicine; Pediatric Otolaryngologist, Department of Otolaryngology, Cincinnati Children's Hospital Medical Center, for assistance with the video contribution to this article.